Case: 18k gold, lavishly florally engraved, gold dome. Dial: enamel, radial Roman hours, auxiliary seconds, blued spade hands. Movement: 19”’, lever escapement, bridge movement, rhodium-plated, “fausses côtes” decoration, wolfteeth winding wheels, gold screw compensation balance, counterpoised lever. 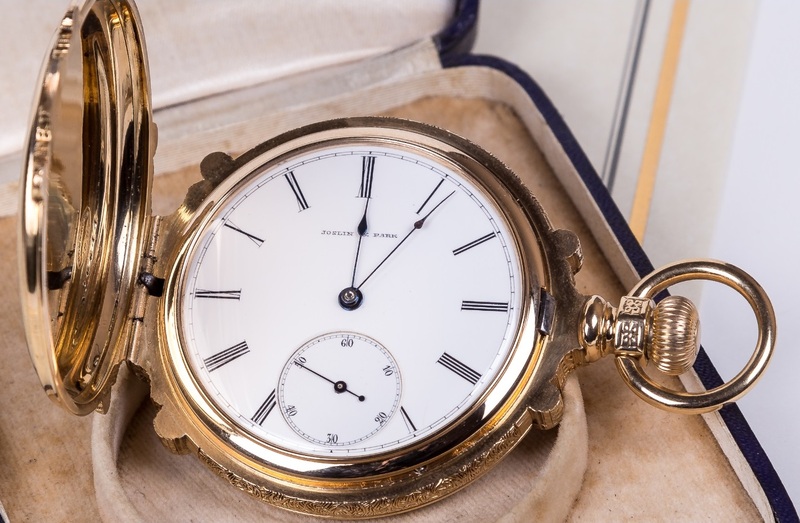 Patek Philippe Extract from the Archives confirming production of the movement for present watch in 1882 and its subsequent sale in July, 1882. Mr. Park received his education in the schools at Bridge of Weir, Scotland, and his first occupation was working in the silk mills of his native place. In May, 1849, while still a boy, he arrived in New York City, and began the career which was destined to make him a successful man. Shortly after his arrival in this country he went to Troy, New York, where he learned the jeweler’s trade thoroughly, with the firm of William L. Adams. Starting as an apprentice in 1852, he worked his way to the top. He remained there until 1862, when he removed to Poultney, Vermont, and became associated with Jervis Joslin, remaining there until the spring of 1866, when he went to Denver, Colorado, and in May of that year he established the first Western store of the well known firm of Joslin Park. In December, 1867, he extended his business, and opened a store in Cheyenne, Wyoming, and he conducted that place while his partner, Mr. Joslin, established a like concern in Leadville, Colorado, under the firm name of Joslin & Park. In 1871 the Salt Lake establishment was opened under the same firm name, which remained until the death of Mr. Joslin, when Mr. Park purchased from his estate his interest in all of the stores, and has since continued the business, doing a manufacturing and retail business of great magnitude. The manufacturing department is one of the best equipped and does the largest volume of business of any house west of Chicago.